In November of 1975, the newly-formed RAPHAEL TRIO made "a most auspicious debut" (The New York Times) at Carnegie Hall as winners of the Concert Artists Guild Award. They have since been presented regularly in the leading concert halls of the United States and Europe, appearing in London, Geneva, Paris, Frankfurt, Vienna, Washington DC, San Francisco, Denver, Pittsburgh, Baltimore, Chicago, Boston and New York. In celebration of their 25th Anniversary, they performed the complete Beethoven trios in cycles in Washington DC (Phillips Collection), Vermont (Marlboro College), and in gala appearances in New York at the Kosciusko Foundation. These performances were broadcast by WNYC and Performance Today, NPR's live broadcast concert series. 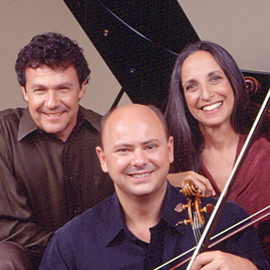 In addition to their commitment to presenting the standard repertoire as well as the lesser-known works by the great composers, the Raphael Trio maintain an active role in commissioning, performing and recording works written for them by contemporary composers. For three seasons they were Artists-in-Residence at the Manhattan School of Music and annually offer a celebratory series at Washington's Phillips Collection. Haydn is the focus of a five-concert series in 2009.